We've been watching a lot of basketball lately, as I'm sure many have. Sometimes we have friends and family over to watch the games, but most of the time we just watch as a family. 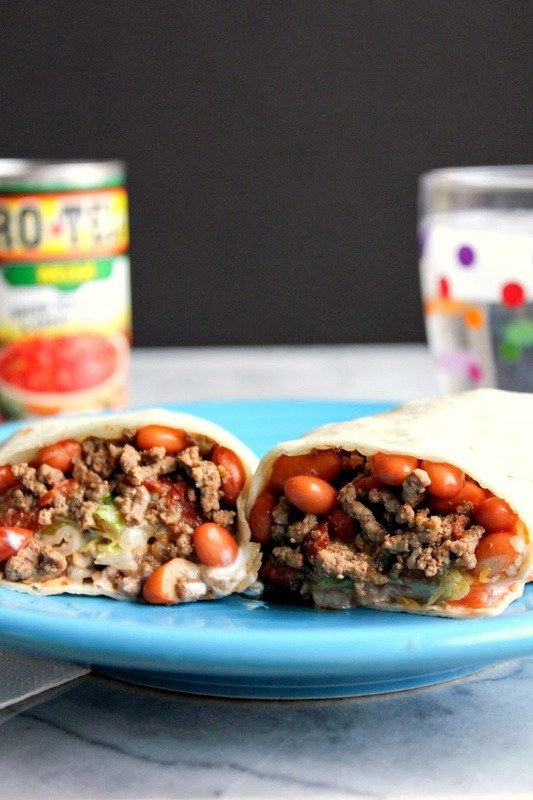 I whipped up some easy and delicious Beef & Bean Burritos the other day and they were perfect for the big game. 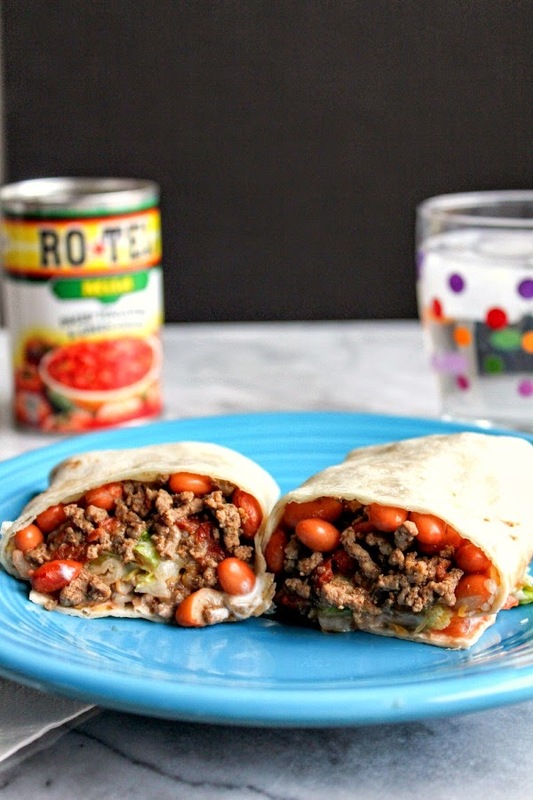 I spiced my beef up with a can of Ro*Tel and the burritos were delicious! I used the mild variety because my youngest doesn't like really spicy foods, but you can substitute with the Original or Hot if you like some heat! Right now there are great savings on RO*TEL at Walmart! Are you creating a big snacking spread for the Big Tournament? Looking for ways to spice up game day and save money at the same time? #JustAddRotel is the perfect way to spice up your favorite recipes. From guacamole to pot roast sliders, adding a can of RO*TEL makes a traditional game day recipe into something extraordinary. Click this link to print a Walmart coupon where when you buy 3 cans of RO*TEL, you will get 1 can free! Hurry, this coupon expires on April 6th and is only good while supplies last! 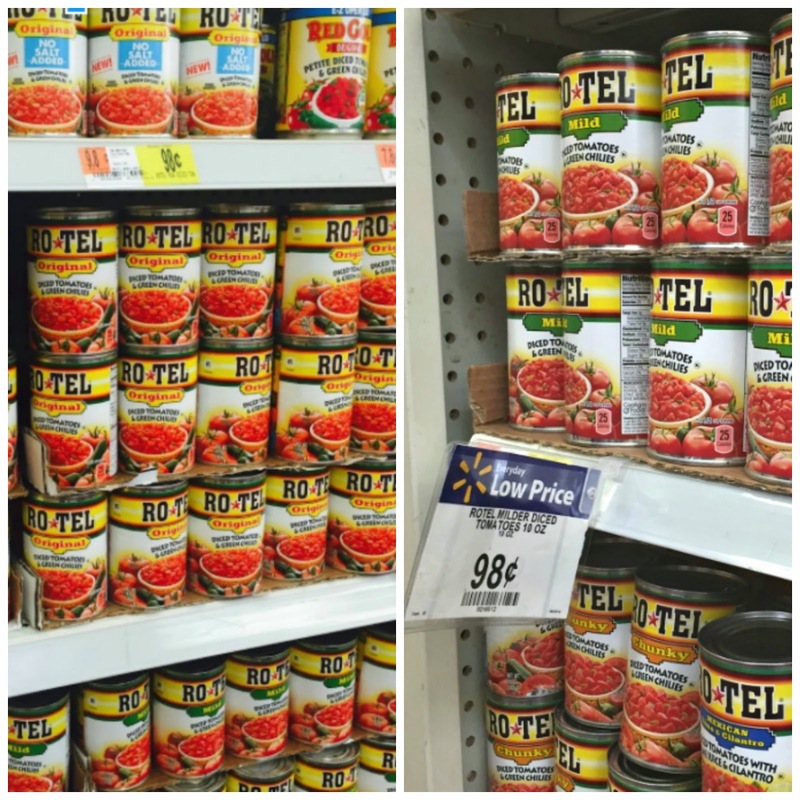 Be sure to look for RO*TEL in either the Pasta or Hispanic aisle in Walmart! Place the pinto beans in a small saucepan and cook over low heat. Cook the ground beef in a large skillet over medium-high heat, breaking the meat up as it cooks. Once the meat has browned completely, drain off any fat and return to the stove. Add the can of Ro*Tel, as well as the cumin, chili powder and salt. Stir until combined and cook over low heat for about 6 minutes. Place the tortillas on a work surface. Add one scoop of the beans to the bottom third of each tortilla, followed by a couple of large tablespoons of the meat mixture. Top with shredded cheese, lettuce, tomatoes, salsa and sour cream. Fold the sides of the tortilla inwards, then start from the bottom and roll up tightly. Top with additional salsa and sour cream, if desired. How do you use RoTel to spice up your meals?